In part due to not properly checking ahead, I've just discovered that it's Diwali this weekend. I'm currently in India on a work trip, visiting a number of people in an office here. Based on something someone said in passing over lunch, I get the feeling that I may be presented with a small gift in the next few days. My attempt to find out if I should get something was rebuffed with roughly "no no, you don't need to, you're from Europe and not a Hindu". 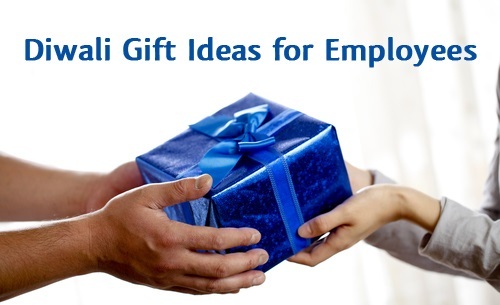 However, the way it was said made me think it might be a "you don't need to, but you might want to, and we're too polite to explain what...."
You said in chat that the colleagues you want to give gifts to report to you as their senior. I live in South-India. I asked a Hindu friend about this. He lives in Bangalore, Karnataka and is retired. His career was in the financial sector in Chennai, Tamil Nadu. The business culture is very similar between those cities. He says that it's quite appropriate for you to give gifts to your team. He recommends you give them sweets. 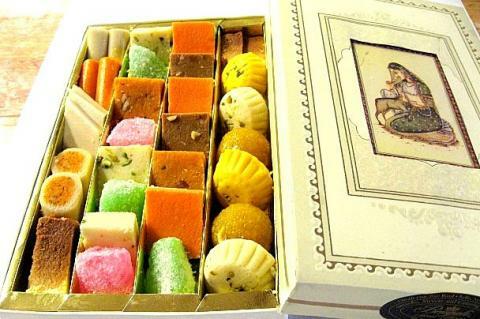 You can go to a confectionery shop and buy these neatly wrapped boxes of Indian sweets. User @AnkitSharma, who lives in Bangalore has provided some details in chat. He says that many items contain milk, so hygiene and quality are important. He recommends that you go for a known store. Typically there are larger chain stores that are known for hygiene and quality. 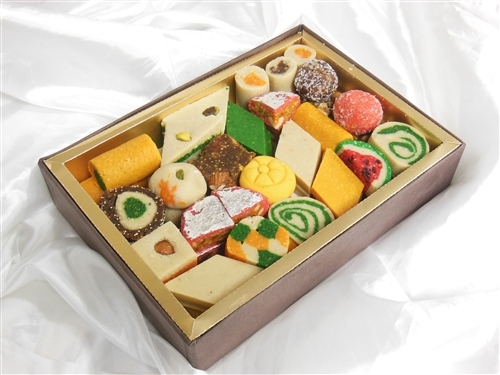 For example, Sri Krishna Sweets, Anand Sweets and Kanti sweets. As per @AnkitSharma's suggestion, you may want to be careful with smaller vendors. Also, boxes don't need to be produced locally, you can get factory-sealed branded boxes. Also, dried fruits, nuts and chocolates are also good options. One of my friend's relatives suggested books. They are quite cheap in India, and they are more lasting than sweets. It depends on whether you know what sort of books your colleagues might like, though. He also said that owners of businesses typically give more expensive gifts to their employees (like smartphones, etc.) but that wouldn't apply to you since you're just a manager who is visiting temporarily and you're not (correct me if I'm wrong) the owner of the business either. So cheaper items seem like the way to go. My attempt to find out if I should get something was rebuffed with roughly "no no, you don't need to, you're from Europe and not a Hindu". While it's true that you'd probably be excused for not giving something (on the basis that you're a foreigner) it would still be quite appropirate for you to give something. In India it's very much appreciated when foreigners participate in local traditions. However, the way it was said made me think it might be a "you don't need to, but you might want to, and we're too polite to explain what...."
Spot on. Politeness is a big thing here, and especially towards people of senior rank. This certainly sounds like they were just being very polite (as is normal here) and didn't want to risk sounding like they were trying to solicit gifts. My advice: Get some nicely wrapped sweets, nuts, dried fruits or chocolates for your team. An individual box for each person wouldn't be a bad idea. They don't have to be expensive, 200-300 INR a piece would be alright. Where I live (town in Tamil Nadu) you can get a decent box of sweets for that price, but it might be more expensive in Bangalore. Books and similar cheap items would also be appropriate. 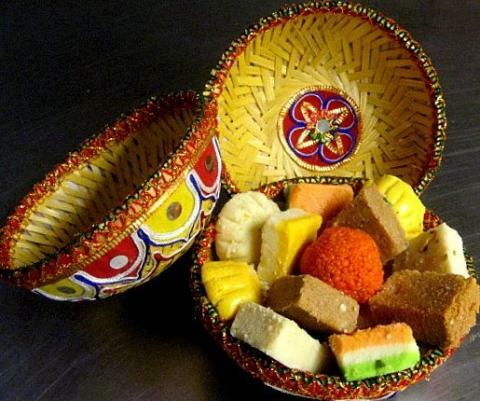 No festive season is said to be complete without relishing your taste buds with delicious gulab jamun, soan papdi, rasgulla, barfi. The perfect treat for all gourmets, you can present sweets in case you are not able to decide on anything else. People love to receive Dry Fruits on Diwali. The advantage with Dry Fruits is that they can be stored for long periods of time besides you don’t have to bother about the specific taste of the person as in the case of sweets. Dry Fruits are relished with joy in the winter season that is approaching at the time of Diwali. Amazingly crafted attractive Diwali gift hamper is the bright choice for enjoying the blissful celebration. You can make your own or can go for ready made hampers, which consist of chocolates, Lord Ganesha statue, diya, dry fruits etc. Silver Gifts are the traditional gifts for the occasion of Diwali. These are available in huge variety and trendiest of designs at the time of Diwali Festival. Lakshmi - Ganesh Silver coins besides crockery items and small silver showpieces are quite popular as Diwali Gifts. Home decoration pieces are something which people might not buy for themselves but love to receive as gifts. 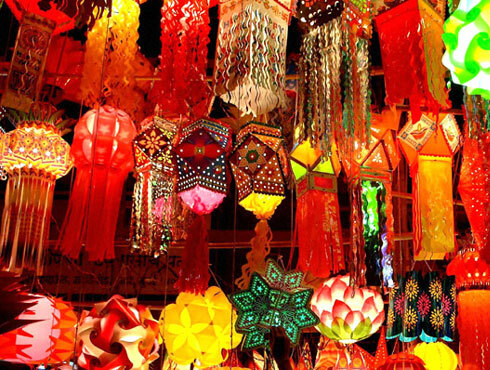 Diwali is the time to make new beginnings, so spruce up the place of your closed ones with resplendent charisma of wall hangings, wooden sculptures, metal lantern etc. Bejewel the moments of Diwali festival with the ravishing, elegant diamond gifts, melange of aesthetic beauty and style. Diamond studded pendant, necklace, ring, are intricately designed to glitter the festive occasion. Present beautifully crafted Laxmi Ganesh gifts and let the almighty powers bestow their love and affection on all your closed ones. Vividly crafted Laxmi Ganesh brass mandir with white metal sculptures are here to make the divine presence. Household gifts like gadgets, chinaware along with the apparels, paintings, crackers, candles, books also enjoy great utility value. As the festival connotes with the enrich traditional values various pooja items like pooja thali, diyas, gold gifts, office stationary are also gaining immense popularity. 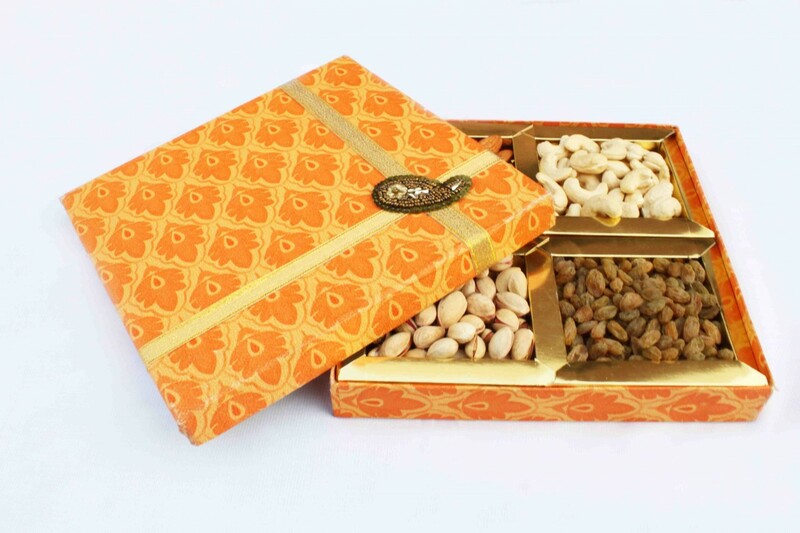 1 First and most appropriate gift for the festive season is a dry fruits gift box for Diwali. So you can choose from wide varieties of Diwali gift packs. 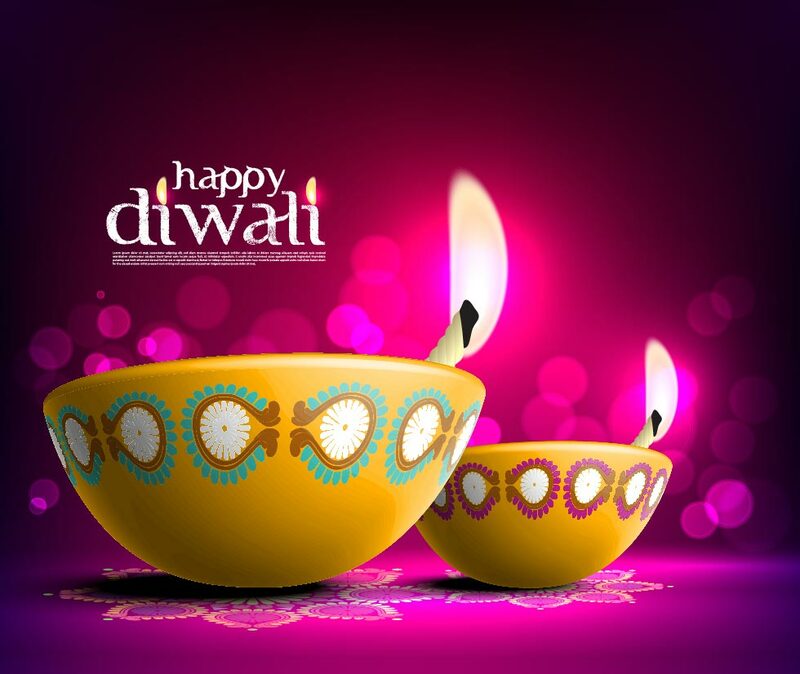 2 Say a Happy Diwali with a greeting card and some diyas or floor rangolis. 3 It can be some crockery or lamps or lanterns. Not the answer you're looking for? Browse other questions tagged india local-customs religion public-holidays gifts or ask your own question. Can I bring a new coffee maker and several small sealed bags of coffee to India from the USA?